The April 15th, 1919 meeting Minutes record a simple, but probably very significant, action. “Mr. Land discussed the general purpose and conduction of the chapter.” This is the first use of the word “chapter” to describe their club. It was also on April 15th that the title of “Brother” was first recorded in the Minutes of the meetings. This was the meeting when the titles of the officers were changed. By the April 22nd meeting, the spelling of “D-e-M-o-l-a-y” had become the accepted title of the group, instead of DeMolai. Also on April 22nd, the first action to approve previous meeting minutes was recorded. April 22nd is also the date of the first record of a prayer being offered to open a meeting. In the April 29th Minutes, the group was again called the DeMolay Council. 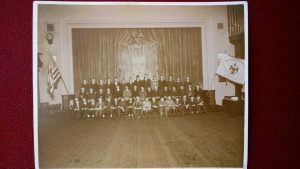 Also in those Minutes is the first mention of the “Council of Ten, appointed by the Scottish Rite Bodies of Kansas City, Mo., to act as advisors for the DeMolay Council.” It was further reported that these advisors were paying an annual dues of $5.00 each directly to the Chapter. This was also the first meeting to record that a closing prayer was offered by the Chaplain, and it was the first time “Mr.” Land was called “Brother” Land. The May 6th meeting was postponed because the sponsoring body was holding its “Spring Convocation” and the Scottish Rite needed the entire building to do their work. On May 13th, an Editor-in-Chief was elected to create a monthly newsletter or publication. On May 27th, the boys passed a motion to establish a regular hospital day to visit on that day, every year, which is the first mention of the concept of an obligatory day. On June 17th, the new corps of officers was formally installed, with the addition of a Senior and Junior Deacon and a Senior and Junior Steward. Curiously, there was no previous mention of an election of officers in the Minutes. The Minutes of June 24th include the first mention of “the word of the day” being collected. That date also included the first appointment of Petition Committees, by High School. In these early Minutes, committees consisting of 1- 3 members were appointed for specific actions or events, but by July, there were some committees with broader responsibilities. All committees consisted of three members, and included the following: Program Committee, Grievance Committee, Camp Committee, Dance Committee, Hospital Day Committee, Outside Entertainment Committee, Inside Entertainment Committee, Finance Committee, Flower Committee, Correspondence Committee, and the Sick Committee. By August 19th, a procedure had been established to vouch for a Brother who did not have the word of the day. September 2nd reported the first instance of an under-age petitioner. It also brought a report that “The Chaplain led the 9 o’clock Interpolation” turning the silent prayer into a formal prayer that sets DeMolay apart from any other youth organization. September 9th brought the first reference to 15 brothers being “initiated” into the Council, which probably means “obligated” at that point because the Ritual was still being refined and rehearsed at this time. There is no official record of the original members being “obligated” except for a recollection reported in “Hi, Dad!” that all the members were given the obligation during the summer, 4 at a time, before the rest of the ritual was written. September 9th could have been a “dress rehearsal” for the big performance later in the month. We just don’t know for sure. The new officers were installed and for the first time included 7 Preceptors. September 27th was the culmination of this early period of the development of our DeMolay “culture” of customary and traditional practices with the first presentation of the official Degrees of DeMolay. This special Saturday meeting was called the “First September Convocation.” It began with a meeting at 10:45 AM. Lunch was served at 1 PM “by the girl friends of DeMolay members.” Then the Initiatory Degree was presented to a class of 34 new members. Supper was served by the girl friends at 6:30 PM and then the DeMolay Degree was conferred at 8:00 PM. The meeting adjourned at 11 PM. It wasn’t until the Minutes of November 11th that the term “Order of DeMolay” entered the official record of meetings. 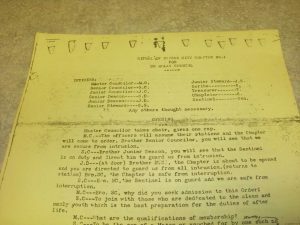 The Minutes of the meetings of the DeMolay Council don’t have a lot of detail, and suggest that they only recorded actions, and not discussion. Do you think these are good Minutes or bad Minutes? How much detail SHOULD be in the Minutes of meetings? The progression of a club meeting to the Order that we now enjoy is not clearly chronicled in the Minutes, or in the history book, “Hi, Dad!” Why didn’t they keep a detailed and careful record of what was happening? Do you think the members were focused on future growth, or were they just having a good time with sports, dances, picnics and other fun activities? When do you think the members understood that what they were doing was much bigger than just their own small club of friends?